Pass this sum into a function that returns either a 1(true) or 0(false). The perceptron first goes through a training process where data is passed through with a known “correct” output. As the training data is passed through the weights are adjusted until the inputs produce the correct outputs with a reasonably high success rate. Following this training process the perceptron can then take in new data without a known output and predict the correct output. To make my own perceptron I followed along with this video in python and translated to ruby as best I could. At this point the code could certainly be improved but seems to work on some level. As I tested it I found the weights being slowly adjusted but never saw the accuracy change. I think there may be a problem, either in the text output or with how I’m storing the variables. Currently it predicts a single output for all input data which is not how its supposed to work. I may also take some time to refactor the loops, since I converted them from python in a very simplistic way. Now, lets say I got this thing working perfectly. It seems relatively simple for a “Machine Learning Algorithm” right? Well it is. It turns out that a perceptron is about as useful as an IF statment. 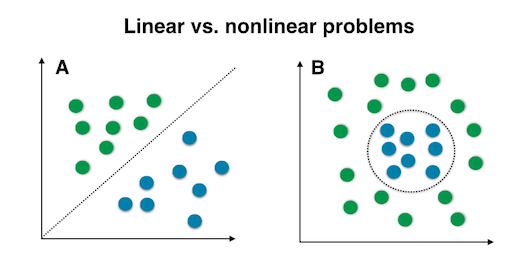 The major failing of a perceptron is that it can only solve “linearly separable problems”. Meaning that if the difference between two groups of data can’t be defined by a line a perceptron will fail. This is also known as a XOR (exclusive OR) problem. This XOR problem with perceptrons was a major blow to the field and its discovery caused an “AI winter” in which there was little AI/ML funding to be found. However, it was quickly determined that chaining multiple perceptrons together by adding “hidden layers” could solve this XOR problem. Thus the perceptron, while limited, represents a fundamental building block in ML that has been expanded on to produce terrifying, brilliant and powerful software. Please see these sources for more information. Much of what I wrote about here comes from Patrick Hebron’s Learning Machines class taught at ITP (NYU) and his syllabus (below) provides a great intro for newbies. In addition another(!) ITP professor has made a series of videos on the subject. Its funny, and provides a much better tutorial than I did 🙂.